The 2018 Hyundai Santa Fe Sport has been reborn as the 2019 Hyundai Santa Fe. This fourth-generation sport utility vehicle model has received plenty of updates: innovative security features, better visibility, an updated exterior, and greater length. We'll go over these updates and see why the 2019 Hyundai Santa Fe is a sporty option, even if it no longer says it in the name. Two inline-four engines that carry over from other Hyundai models-the 185-hp 2.4-liter and the 235-hp turbocharged 2.0-liter. Both are mated to a new eight-speed automatic transaxle. No matter the trim level, all-wheel drive is an option. The Santa Fe is sporty, though not as much as the best in its class. Still, you'll go zero to 60 in about seven seconds. Shifting gears and stopping and starting is smooth as silk. Don't worry about power, because in 2020 comes the 2.2-liter diesel inline-four offering a variable-geometry turbocharger. That new engine generates 190 horsepower and 322 pounds per feet of torque. So if it's not powerful enough for you yet, it will be. The new 2019 Hyundai Santa Fe is a big leap in the right direction in the looks department. 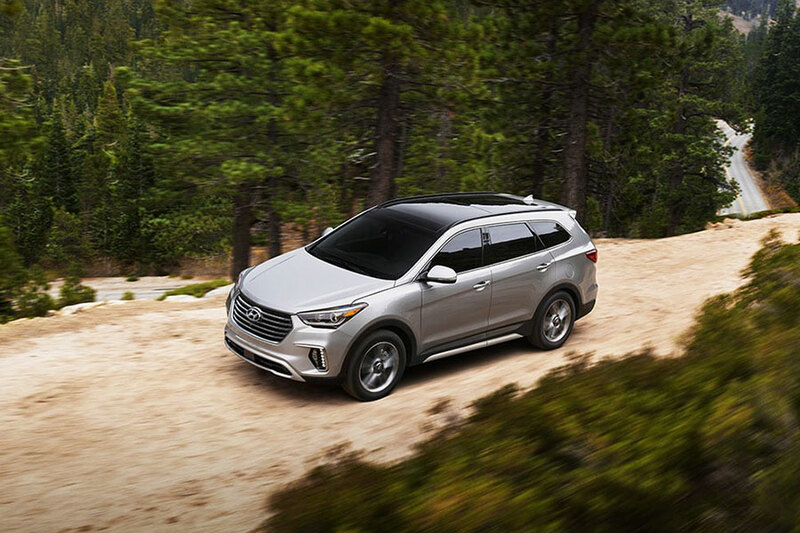 The Santa Fe is longer, with a wider wheelbase, and Hyundai says the 2019 version has 41 percent more glass, increasing visibility and contributing to an open feeling inside. The front grille has a new cascading design that looks like horizontal waves or flattened honeycomb. Headlights are narrow slits on top with bold pentagons of LED lights for headlamps. The tail lights are narrow, with reverse lights lower down. A wide gray back bumper gives the rear a distinctive look while double exhaust pipes on the right side complete the picture. The overall result is a thoroughly modern, distinctive look that looks best, in our opinion, in blue steel. My, oh, my. 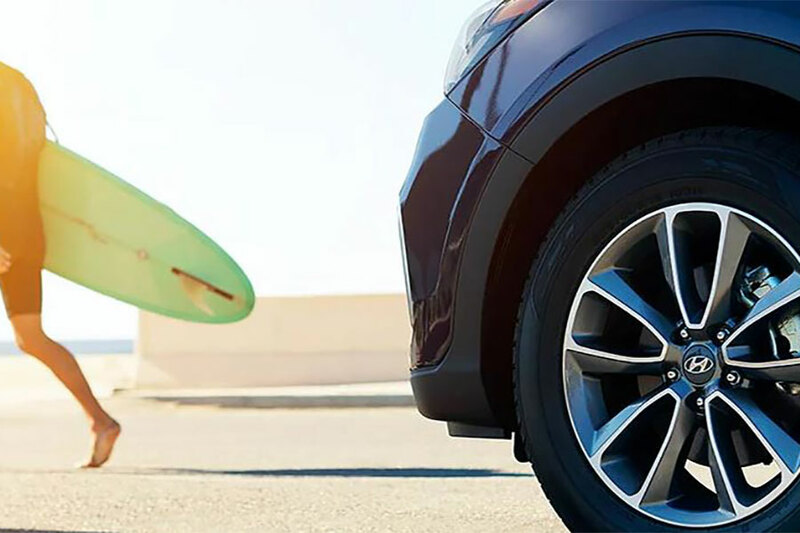 Safety and security is where the 2019 Hyundai Santa Fe really shines. The Santa Fe has all the active safety equipment we've come to expect for midsize SUVs, like six airbags, forward-collision warning with automated emergency braking, lane-departure warning and lane-keeping assist, driver-attention warning, automatic high-beams, rear cross-traffic alert, and blind-spot monitoring with avoidance assist. But then Hyundai has gone above and beyond in a couple ways. This year Hyundai introduces the all-new Safe Exit Assist and Rear Occupants Alert. Safe Exit lets you know of approaching vehicles or bikes, keeping the doors locked if there's a problem. You won't clothesline any bikers or witness your door taken off by an oncoming car. The Rear Occupants Alert employs a sensor to tell if there is movement in the back seat. We can think of all kinds of applications for this one, everything from reminding you when you've almost left a pet in the back of a hot car to letting you know if the rugrats have somehow unlatched their car seat's safety belt. Hyundai has boldly stepped into the future with the all-new 2019 Santa Fe. This SUV is a welcome addition to the brand lineup and should please families who love an attractive car that more than takes care of their needs while keeping them safe.